The refreshed Volvo S80 for model year 2010 has a tough and exclusive design, while providing top-class fuel consumption and CO2 emissions, performance, driving characteristics and comfort at the same time. All this reinforces the model's position in the premium sedan segment and satisfies customers with high demands. The Volvo S80 is the second generation of Volvo's large prestige sedan. 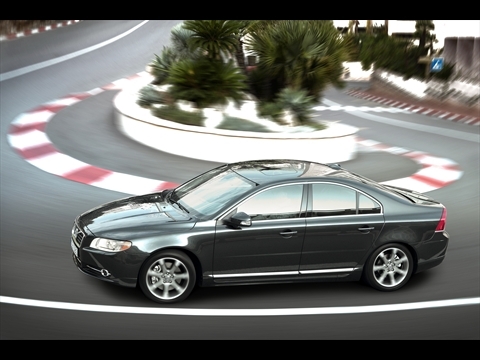 The S80 model is a luxurious car with an elegant and dynamic profile influenced by modern Scandinavian design. A new generation of driving and support functions together with a further enhanced body structure and advanced interior safety features, all interact to contribute to the high level of safety, both preventive and protective. On the outside Volvo S80 for 2010 gives a long, wide and broad impression. The grille's larger iron mark and the new brightwork (on the air intakes, the doors' lower parts and below the tail lamps) enhance the car's distinctive impression and make the front look "tougher". The refreshed Volvo S80 includes a number of new design features on the inside, in addition to the exterior design updates. The interior expresses exclusivity and comfort, characterised by the soft leather with matching stitching. The door panels follow this theme as well. The characteristic centre stack has a silk metal frame, contributing to the exclusive impression. In addition, the refreshed S80 has aluminium dials and new steering wheel alternatives. The four-spoke steering wheel's décor trim with silk matte metal effect can be found in the gear selector and around the starter button as well. The Volvo S80 is 4851 mm long and its total width including mirrors, outer edge is 2106 mm. The height is 1493mm (at curb weight). In order to give the car a solid and compact image, it has a rounded contour and the bonnet has a raised profile. The headlamps, which are positioned lower than on the earliest S80 models, follow the curvature of the front and are extended along the side and up towards the bonnet, creating a gentle smile at the front. The doors are convex and pronounced in shape. They include the rearmost side window. The sills have a pronounced profile, creating a visually low centre of gravity and imparting a steady and stable appearance. In order to give the Volvo S80 the right aura of elegance and create an image of being in constant motion, the car has sweeping lines with a comet-shaped profile, an almost imperceptible transition between the rear window and the boot and a cut-off tail section. 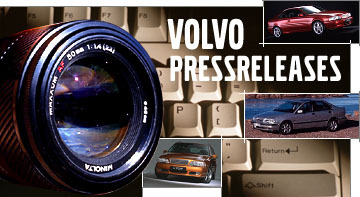 A somewhat larger, vertical grille marks the car's Volvo heritage. The bonnet's characteristic V-shaped lines are extended all the way down into the spoiler. And those typical Volvo tail lamps have a slim profile that blends in smoothly with the broad shoulders. LED lights at the top enhance the Volvo heritage clearly even in the dark. The rear spoiler is a discreet colour-coordinated accessory. It enhances the car's sporty appearance and helps improve the car's handling characteristics - especially at high speeds. The spoiler is made of lightweight plastic. The interior design is characterised by clean surfaces, harmonious lines, exciting contrasts and smooth function - expressions of Scandinavian design tradition that help forge a dynamic and harmonious interior atmosphere. The Volvo S80 has a super-slim centre console similar to the one introduced earlier in Volvo's medium-segment models. In the S80, the centre console is modified to blend in seamlessly with the car's more classic and exclusive design, and it extends all the way to the rear seat. If the car is equipped with power front seats, they can be optionally specified with upholstery in perforated and ventilated leather. Fans in the seat cushion quickly reduce cushion temperature to a pleasant level and contribute to high seating comfort. The rear seat splits and folds. The front passenger seat backrest can also be folded. Sun curtains for the rear doors are available as an option. The sun curtains are fully integrated into the rear door panels. The sun curtains are hung on the hook in the upper edge of the door. The window can be opened without lowering the sun curtain as it is not held up by the window. The modernised claret walnut wood inlay is an option. It gives the interior a more elegant and dynamic design. A total of nine different surfaces are offered. Volvo Cars has a holistic approach to safety, which encompasses both preventive and protective safety. Preventive safety - the avoidance of accidents - was one of the most important starting points when the S80 was being developed. It led to the creation of an entirely new generation of advanced driving and support systems. Adaptive Cruise Control (ACC) uses a radar sensor to help the driver maintain the distance to the vehicle in front. Collision Warning with Brake Support (CW) helps avoid rear-end impacts, minimising the risk of such collisions. The Volvo S80 is also equipped with BLIS (Blind Spot Information System) and IDIS (Intelligent Driver Information System), two innovations that help the driver maintain better control over the traffic situation. BLIS registers if another vehicle is in the offset rear blind spot alongside the car and alerts the driver via a visual signal. IDIS helps stop the driver being distracted by non-essential information in pressing situations, for instance by delaying incoming phone calls or SMS. Active Bending Lights - moving headlamp beams that follow the curvature of the road - help maintain the best possible visibility in the dark on twisting roads. the alarm has been set off and someone is inside the car. Protective safety in the Volvo S80 is structured in the form of a network of exterior and interior safety systemsand functions that interact to reduce the risk of occupant injury in the event of a collision. The exterior systems have the task of distributing and absorbing incoming collision forces so that the passenger space is preserved as intact as possible. The body is therefore built in the form of a box-section structure using varying grades of steel, with all the components interacting to provide controlled deformation. 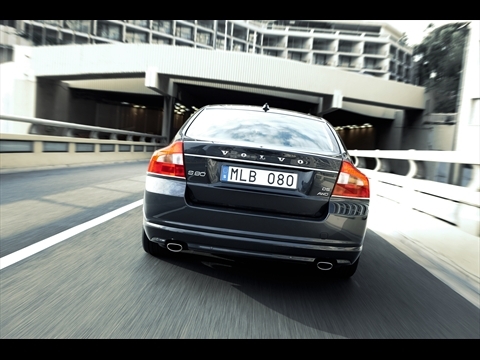 Like the rest of the Volvo range, the Volvo S80 features a transversely installed engine and front-wheel drive. Transverse engine installation provides more deformation space in the engine compartment and helps reduce the risk of engine intrusion into the passenger compartment in a frontal collision. The larger six- and eight-cylinder engines have also been able to be installed transversely in the S80 model thanks to their extremely compact dimensions and effective packaging. The purpose of the interior safety systems is to keep the passengers securely in place and to minimise the risk of serious injuries. In order to provide the most effective protection possible, Volvo Cars has developed a number of unique systems. Side-impact airbag makes Volvo's patented SIPS (Side Impact Protection System) even more effective. The side-impact airbags feature two separate inflation chambers - one at hip height and one at chest height. Since the hips can withstand greater impact than the chest can, the lower chamber is inflated at five times higher pressure than the upper section. The side-impact airbags interact with the inflatable curtains (IC) and the body's network of beams to protect as effectively as possible. Volvo's system for avoiding neck injuries - WHIPS (Whiplash Protection System) - is one of the most effective on the market. In the event of a severe impact from the rear, the front seat backrest and head restraint move together with the occupant's body, thus damping its movement much like the way the arms move rearward when catching a ball. In the latest generation of WHIPS, the system's function has been further developed to provide an even smoother "catching" motion. All five seats are equipped with three-point inertia reel safety belts, belt pre-tensioners and head restraints. The highest possible safety requires that all occupants always use their safety belts. The Volvo S80 can be equipped with the HomeLink function. The function makes it possible to operate up to three remote controlled home devices (e.g., garage door, home alarm system, etc.) via a module integrated into the sun visor. HomeLink contributes to easy and safe access to your home. 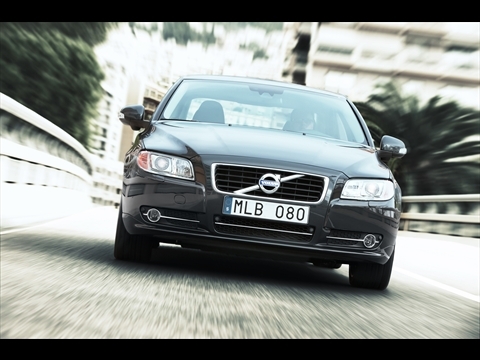 Volvo S80 is available with an advanced function that helps reducing the risk of alcohol-related traffic accidents. This function, Alcoguard, is an immobiliser that helps the driver to make a decision whether to drive or not while influenced by alcohol. However, it is ultimately the driver's responsibility to make "sober" decisions in relation to the Alcoguard function's recommendations. Like the rest of the Volvo range, the Volvo S80 has a transverse driveline and front-wheel drive, or alternatively All-Wheel Drive (AWD). The transverse engine installation permits effective space utilisation for deformation in the engine compartment and also makes it possible to create a more spacious passenger compartment. There is a number of engine alternatives. The 3.2-litre super-compact six-cylinder in-line aluminium engine features an advanced valve train with two lift heights and a variable intake system that contributes both to good performance and considerable fuel efficiency. Several innovative solutions have also made it possible to build the engine with particularly compact overall dimensions. The T6 engine, as it is designated, is combined with All Wheel Drive in the Volvo S80. The T6 uses twin-scroll technology and is optimised for a very sporty driving experience. At the same time, it is programmed to give the highest possible performance with the lowest possible fuel consumption and exhaust emission levels. With four-wheel drive - All Wheel Drive - the engine is utilised in an optimal manner by transferring the maximum amount of power onto the road surface. A powerful V8 engine and a particularly compact six-cylinder in-line engine provide performance and driving comfort of absolute top class. The V8 engine features Volvo's electronically controlled All-Wheel Drive. An active chassis is available as an option, contributing to the car's highly dynamic driving characteristics. Two new five-cylinder diesel engines are now being introduced for the Volvo S80 - the high-performance, twin-turbo D5 and the medium-performance, single-turbo 2.4D. Actually, the new engines only share the number of cylinders with their predecessors. The D5 engine has several advanced technical features, such as the twin turbochargers and the fuel injection system, which provide an excellent combination of high performance and low fuel consumption. The D5 engine fulfils the Euro 5 norm. The development of the new D5 has resulted in low engine noise and enhanced comfort. It delivers 205 horsepower and 420 Nm, and the fuel consumption is 6.2 l/100 km (164g/km). With an automatic gearbox, fuel consumption is 6.7 l/100 km (178 g/km). The new 2.4D engine is a medium performance engine based on the same technology as the D5. It is a single-turbo version, providing even lower fuel consumption. Preliminary fuel consumption figures are 5.9 l/100 km and 155 g/km (CO2 emissions). With an automatic gearbox, fuel consumption is 6.6 l/100 km and the CO2 emissions are 174g. The 2.4D fulfils the Euro 5 norm. It delivers 175 horsepower and 420 Nm. The turbocharger has been optimised for producing high torque already at low revs. There is a DRIVe (Volvo's environmental concept) version of the Volvo S80 available , combining large-car qualities with low fuel consumption. The driveline includes a 1.6 litre diesel engine and a manual gearbox. The engine falls into Volvo's 120 g category (out of three different categories: 120g, 140g and 160g depending on the car's size and other things). The 1.6D DRIVe delivers 109 horsepower and 240 Nm. Fuel consumption is 4.5 l/100 km and CO2 emissions are 119g, 21% lower than the 2.0-litre diesel engine. There are other unique features that characterise the Volvo S80 DRIVe model, such as special tyres with low rolling resistance and an optimised electronic power steering. The D5 is available in the four-wheel drive Volvo S80 AWD too. The combination of All Wheel Drive and the high torque of the diesel engine results in exceptional accessibility and driveability on all road conditions and in all situations, and also provides very good fuel economy. The Volvo S80 D5 AWD will be offered with an automatic or manual gearbox, both with six speeds. The Volvo S80 with V8 or six-cylinder engine can optionally be specified with an active chassis based on Volvo's Four-C technology. With this system, the chassis setting is automatically adjusted to suit the current driving situation, thus improving both handling and ride comfort. Three alternative chassis settings allow the driver to alter the car's driving behaviour to suit his or her personal tastes at the mere touch of a button. The V8 version of the Volvo S80 is equipped with Volvo's All-Wheel Drive. The AWD system uses an electronically controlled hydraulically activated clutch to distribute power between the front and rear wheels to provide the best possible road grip in all situations. The Volvo S80 can be equipped with a 2.0-litre, four-cylinder Flexifuel engine (2.0F) and a 2.5FT with 5 cylinders. Flexifuel is a driveline design that allows the engine to be run on petrol and/or E85 bioethanol. Bioethanol is a renewable fuel that contributes to a significant reduction of fossil carbon dioxide. A 2.5-litre, five-cylinder Flexifuel engine was introduced 2008. This engine features a turbocharger and produces 231 hp. The 2.5 l 5-cylinder in-line turbo engine is available in a Flexifuel model. The engine delivers 231 hp and 340 Nm torque. It is compatible with both manual and automatic gearboxes. The Flexifuel engine meets the European emission standard Euro 5. *All diesel engines have a turbo function. A six-speed automatic Powershift gearbox is available for the Volvo S80 (read technical specifications). Powershift provides lower fuel consumption (8% lower), in comparison with other automatic gearboxes. In addition, it improves drivability. The chassis with MacPherson struts at the front and Multilink axle at the rear is designed to ensure predictable driving manners and alert steering response. The Multilink rear axle is an independent suspension system with a number of links that are set up to provide a combination of controlled wheel movements and high level of riding comfort. Some of the links have the task of providing a certain degree of anti-skid steering effect. A long wheelbase and wide track together with an extremely torsionally rigid body contribute to the well-controlled driving manners. In accordance with the Volvo S80 refresh concept, two new chassis are introduced - Sport and Comfort. This makes Volvo S80 an interesting choice for a broader group of customers - both the ones with a sporty driving style and those more comfort-oriented. The sports chassis has a number of features that provide very sporty driving characteristics. In addition, the chassis settings give the car a stronger and more powerful impression. The comfort-oriented chassis gives all occupants, and especially the rear seat passengers, a limousine-like comfort experience. Volvo's advanced DSTC (Dynamic Stability and Traction Control) system is fitted as standard. DSTC steps in and helps the driver bring the car back in line if there is any tendency to skid. Volvo S80 can be equipped with Self Supporting Tyres. A Self Supporting Tyre is constructed with stiffer sidewalls in order to carry the intended weight even if a puncture occurs. It is possible to drive at a maximum of 80 km/h for 80 km (fully loaded car) with Self Supporting Tyres. Driveability with a punctured tyre is almost equivalent to an optimally inflated tyre. Two new aluminium wheels are available: Atla 16" and Cassini 17". The Volvo S80 can be equipped with the Tyre Pressure Monitoring System - a control system that warns of low pressure in the tyres. The system has a pressure sensor integrated into the inflation valve in each wheel. The sensors are activated by an accelerometer at speeds over approximately 40 km/h. Volvo S80 with the High Performance or Premium Sound systems is equipped with an USB port, making it easy to attach an iPod®, other MP3 players or even a digital camera to the audio system. High Performance and Premium Sound levels have an HD (digital) radio function as standard. With the HD radio function, the driver and passengers can listen to analogue FM radio channels, although with digital quality. In some European countries the Premium Sound and High Performance audio systems can be supplemented with DAB-radio (Digital Audio Broadcast). This function makes it possible listening to radio broadcasts with CD quality. Volvo S80 can be equipped with an additional high-tech function - digital TV, making it possible to watch land-based digital TV in the car. The system also makes it possible to watch pay-per-view television broadcasts, among other things. The Volvo S80 is built and equipped to impact as little as possible on the global environment, and to provide a clean and healthy in-car environment. Volvo IAQS (Interior Air Quality System) effectively reduces the amount of particles, pollen, gases and certain unpleasant odours in the air that enters the passenger compartment. In addition, all textiles and leather are certified under ÖKO-TEX 100. This is an international standard, which ensures that fabrics and hides have been thoroughly tested to check for certain allergy-inducing substances and emissions. The climate unit can also be supplemented with the Clean Zone Interior Package, an advanced system that provides healthier air quality inside the passenger compartment (approved by the Swedish Association against Asthma and Allergy). When the car is unlocked using the remote control, the passenger compartment is automatically ventilated for about a minute if the outdoor temperature exceeds 10 degrees Celsius.